One of the upsides of fall is getting to wear my wool hats. From fedoras, to floppy brim, to the baseball cap, I have quite the collection. 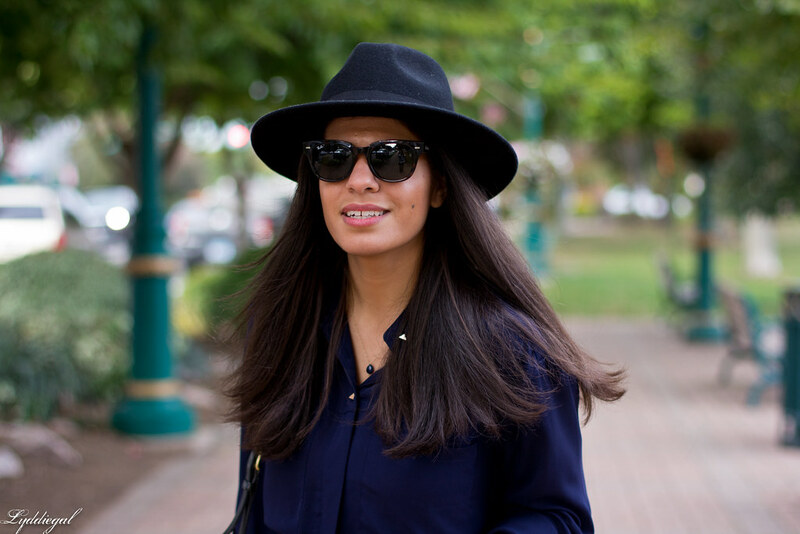 During the summer months, my panama hat is my go-to for any situation. Dressy, casual, it magically goes with everything. For the fall and winter, I'm still searching for my 'magic' hat. I was hoping this black fedora would be it, but the jury is still out. Love the hat on you! I keep seeing them on blogs, but I have no idea how to wear them. Do you wear it inside? I'm so curious about the hat wearing standards. Love the hat and I'm still on the hunt for the perfect Fedora to actually fit me! Super cute look. This hat looks good on you! I have such a thing with hats- they look great on other people, but not so much on me. I have kind of been wanting a black floppy hat recently though! This jury thinks the hat looks great! :) I don't own a single winter hat, but I want one so bad. Such a gorgeous look! And loving the hat! I just love this hat!!! And those jeans are perfection. I have been looking for the perfect pair of grey jeans! I want everyone to be a hat person, so we can just wear them all the time and it be normal- like when boys (or girls) wear baseball caps. Everyone get a wool fedora and let's do this! I seriously look like such a dork in hats - I'm forever envious of how perfectly you pull them off! I'm digging the hats right now. And that cuff is AMAZING! 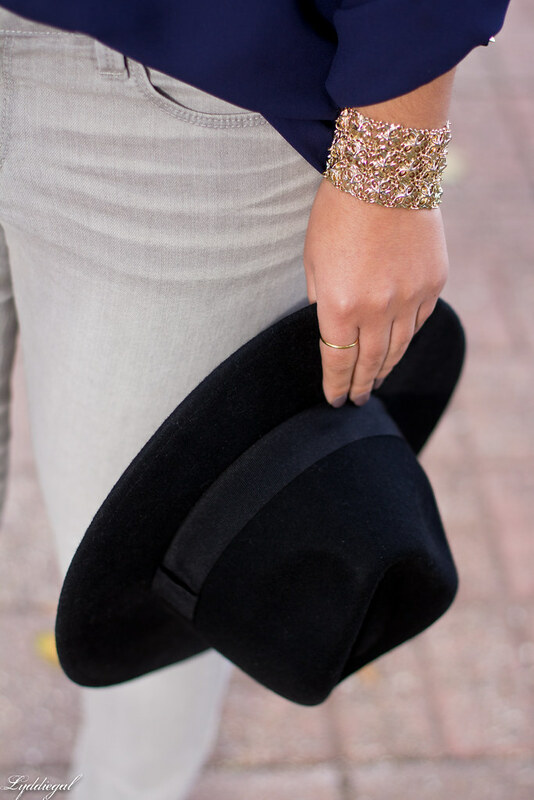 I am loving hats for fall and this one is so cute! And that is the perfect pair of gray jeans. I love the shade. You always inspire me when it comes to hats and this one is no exception. You just make hats look so natural. Gah. The whole outfit is awesome! Love the dark blue top with those gray accents:) You look so chic! I like that fedora!! Black fedoras are always so hard, they can either skew Amish or cowboy. So I'm jealous you were able to find one! oooh I LOVE that hat! It's amazing on you! Love this outfit, it's such a great basic fall outfit for the days you have no idea what to wear. Plus, that hat looks great on you! You've really got a knack for putting great outfit together. I love this one! Another amazing addition to your awesome hat collection...love it on you! The jury voted and you won the hat wearing decision. Love this look on you. I think it's a perfect hat for winter! It will go with everything and it really flattering on you! You were the one who got me interested in hats! I love seeing how you style them! This hat suits you! I look awfullllll in hats but I admire people who can pull them off - like you! The hat is the perfect detail to add to this look, I love it. Okay, I vow that when I (eventually) have long hair, I'm going to try more hats! Love the hat on you, it suit you so well and your hair is perfect. Who doesn't love fall for the hats! You look so lovely as usual. Really love the shoes and bag! I am like you and wear hats all summer long. Winter hats are somehow more difficult for me to pull off. This hat is a great option for you. I want so badly to be able to pull off a hat. You do it so well! 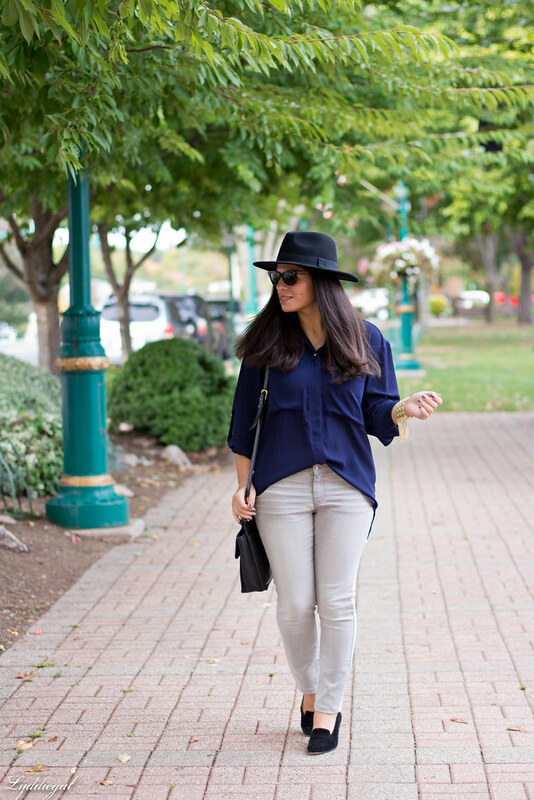 The fedora TOTALLY works for fall and winter! I can't wait to see more outfit pics with this! What a great fall look, I love this hat!